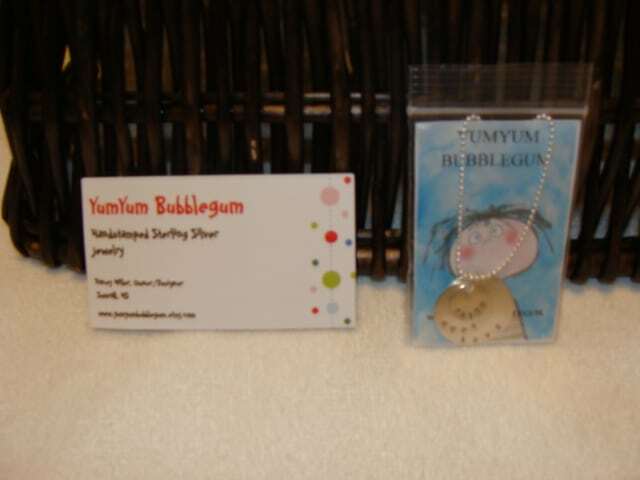 When I saw I had a package from the YumYumBubbleGum’s etsy shop when I arrived home from work, I felt like a little girl at Christmas! Having been to this wonderful shop before, and in talking to the owner, I thought I’d be in for a great treat. And, just like on Christmas, my package exceeded my expectations! I received a beautiful pendant – it is a triple disc necklace in sterling silver. I chose to have the discs say FAITH, HOPE and LOVE because these words are based on a Bible verse that I hold very near and dear to my heart. I really like the fact that I could choose the style of writing that I wanted on my necklace because there is a wide variety of choices including: block uppercase font (3 sizes); “curly” lowercase font; and designer “izzy” lowercase font. I was able to choose not only the font that I wanted but also the order in which I wanted the words to appear. 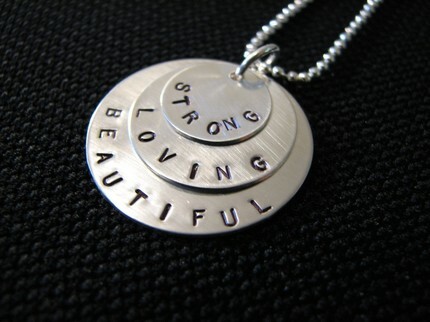 I love the finish to my necklace – it has a beautiful shine to it and the letters are much darker so it is easy to read. I also had a small polish cloth included with my necklace so that I can shine it up whenever I think it needs a little extra shine to it, which I appreciated! I absolutely adore this shop and I’m really glad that I found it! I have already told a number of my friends about the shop because I love the variety of items that are available (in addition to my necklace, I also really like the soldered photo pendant with charm and the handstamped family name ring and the fact that Tracey will personalize most items to meet anyone’s wishes! I like the HANDSTAMPED STERLING SILVER BUTTERFLY NECKLACE with a Swarovski crystal added. 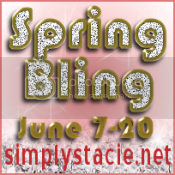 I belong to the Simply Stacie Blog Frog Community. I would love the STERLING SILVER HANDSTAMPED FAMILY NAMES RING! Cute!